"Kellogg's Frosted Flakes Gold(TM) is one example of Kellogg Company's continued commitment to provide better-for-you options that moms can feel good about." "Kellogg's Frosted Flakes Gold(TM) offers better-for-you nutrition that will satisfy moms and a great taste that kids will love"
Better for you than what Jennifer? Better for you than regular Frosted Flakes? Better than a bowl filled with white sugar? Compared with regular Frosted Flakes your added benefits include 1 whole gram less of sugar (1/4 of a teaspoon less), 1 whole gram more protein and 2 whole grams more fibre. 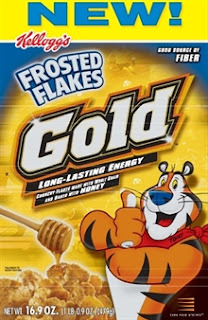 Oh, and compared to regular Frosted Flakes the Gold version also has 36% more salt. Similarities include sugar being the second ingredient on both, identical calories, and identical micro-nutrient breakdowns. The press release also expounds on the fact that they're "baked with honey" as if that's a healthier and more nutritious form of sugar. Sugar is sugar, God sugar, man sugar and bee sugar - they're all just sugar. My advice - if you happen to try them and love the taste, eat 'em, but please don't buy them because you think they're better for you than other sugary cereals 'cause they're not.